Electrical energy is commonly measured in units of kilowatthours. Electrical power is expressed as kilowatthours per hour or, more commonly, kilowatts. 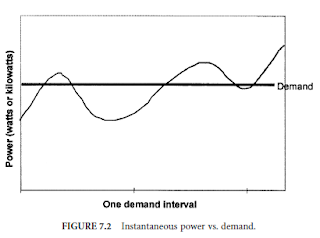 Demand is defined as power averaged over some specified period. Figure 7.2 shows a sample power curve representing instantaneous power. In the time interval shown, the integrated area under the power curve represents the energy consumed during the interval. This energy, divided by the length of the interval (in hours) yields “demand.” In other words, the demand for the interval is that value of power that, if held constant over the interval, would result in an energy consumption equal to that energy the customer actually used. Demand is most frequently expressed in terms of real power (kilowatts). However, demand may also apply to reactive power (kilovars), apparent power (kilovolt-amperes), or other suitable units. Billing for demand is commonly based on a customer’s maximum demand reached during the billing period. Electrical conductors and transformers needed to serve a customer are selected based on the expected maximum demand for the customer. The equipment must be capable of handling the maximum levels of voltages and currents needed by the customer. A customer with a higher maximum demand requires a greater investment by the utility in equipment. Billing based on energy usage alone does not necessarily relate directly to the cost of equipment needed to serve a customer. Thus, energy billing alone may not equitably distribute to each customer an appropriate share of the utility’s costs of doing business. For example, consider two commercial customers with very simple electricity needs. Customer A has a demand of 25 kW and operates at this level 24 hours per day. Customer B has a maximum demand of 100 kW but operates at this level only 4 hours per day. For the remaining 20 hours of the day, “B” operates at a 10 kW power level. Assuming identical billing rates, each customer would incur the same energy costs. However, the utility’s equipment investment will be larger for Customer B than for Customer A. By implementing a charge for demand as well as energy, the utility would bill Customer A for a maximum demand of 25 kW and Customer B for 100 kW. “B” would incur a larger total monthly bill, and each customer’s bill would more closely represent the utility’s cost to serve.